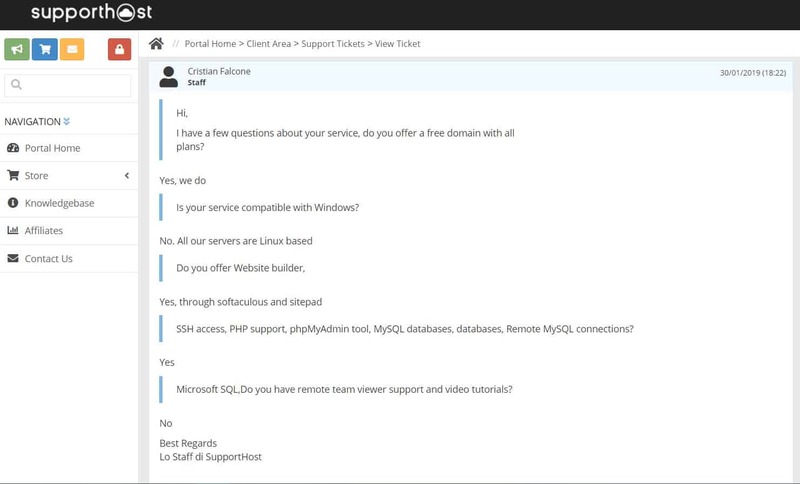 SupportHost Review 2019: Is SupportHost a Good Hosting? SupportHost offers a full set of features, diverse plans for a wide range of needs, a state-of-the-art data center, excellent uptime, and an engaging cPanel. It also provides great support in English and Italian. Founded in 2010, U.S.-based SupportHost offers a wide range of Linux web hosting services including shared hosting, semi-dedicated hosting, dedicated servers, reseller hosting, cloud hosting, and VPS. SupportHost also has an impressive website available in English and Italian. In addition to its multiple services, SupportHost offers domain registration and CMS hosting services for WordPress, Joomla, Magento, PrestaShop, and Drupal. Whether you’re a beginner or a veteran, SupportHost provides you with everything you need to create and run a thriving website. SupportHost has a data center in Germany that is powered by hydroelectric energy and backboned by Intel Xeon processors to deliver faster speeds than other web hosting providers. In addition, you’ll enjoy the provision of SSD storage with NVMe technology and 1Gbps connection speeds. To ensure the security of its servers and data, SupportHost uses top-notch security measures including Clam AntiVirus, DDoS protection, fingerprint scanners, iris scanners, and computerized motion detectors. An auxiliary diesel generator is available in case of power cuts together with redundant connections to maintain quick access to websites. Thanks to its user-friendly and multilingual cPanel, SupportHost makes it easy for beginners and pros to run different tasks without a hassle, such as creating FTP accounts, changing PHP versions, adding a subdomain, and creating/restoring backups. The File Manager allows you to download, upload, edit, compress, and extract directly from your web browser. With the built-in Softaculous app, it’s also easy to install a large number of scripts in a single click. With a number of flexible packages at competitive prices, SupportHost is suitable for a variety of web hosting requirements. You can choose from basic shared hosting all the way up to high-powered dedicated servers. All plans also come with a free domain and you get the first two months of hosting free if you’re transferring from a different hosting service. With a 30-day money-back guarantee, subscribing to SupportHost is completely risk-free. It also offers a 14-day free trial on selected services, such as semi-dedicated hosting. Despite the lack of live chat support, SupportHost has a highly responsive support ticket team, a call center, and a direct email channel for its current clients, all available 24/7 even during the holidays. I submitted a ticket with lots of questions and received a detailed response in less than ten minutes. For self-assistance, I recommend checking out SupportHost’s extremely comprehensive knowledge base and easy tutorials. 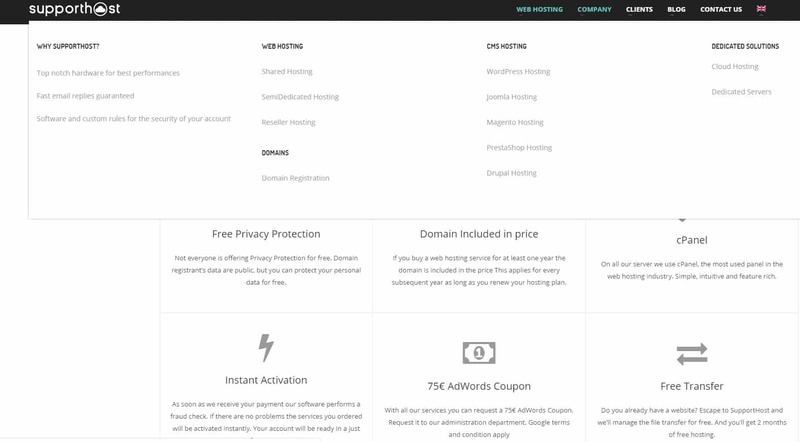 If you don’t want to spend too much time tinkering around with manual setups, SupportHost makes it easy to get your website up and running in no time. It’s suitable for a wide range of users with up to 99.9% uptime guarantee. Wondering how SupportHost stacks up against other Web Hosting companies? Enter any other Web Hosting company and we will give you a side-by-side comparison.